I am with you. Mornings have never been my forte. For me, saying, “I’m not a morning person,” is the understatement of the year. I am a single working parent and am lucky enough to be able to set my work hours. I never schedule any meeting before 10:00 am if I can help it. My six-year-old just started Kindergarten this year, and the morning meeting at school begins promptly at 8:30 am. It is the first time we have had to get ready and out of the house on time for anything. Previous to attending Kindergarten, my girl participated in a small home-based preschool for three years, but drop off could occur any time from 8:00 am to 9:15 am, and hot fresh snacks and lunch were served daily, so all we had to do was show up. The days at Honalee preschool began slowly with free choice play and leisurely check-ins with teachers. Set the scene: Better mornings begin the night before. With a little bit of planning and organization, you can set yourself, and your children for a (relatively) stress-free start to the day before heading off to school and work. For us, this means doing everything that can be done to prepare for the next day the evening before. I hung a large monthly calendar on the wall that notes events and reminders about field trips, sharing days and themes, special events, volunteer days, and school vacations, and made a simple checklist (words and pictures) for myself and my girl and tacked it up next to the door. It has become a nightly ritual for us to check the calendar and the weather for the following day before bed. My girl chooses and lays out clothes for the next morning. We pack her backpack and place it by the door. We clean her glasses and put them in their case in a basket by the door. Shoes are in the basket by the door, coats and raingear hung on low hooks by the door. My girl sets the breakfast table. I prime the coffee maker and plan simple breakfasts that include protein and which I prep ahead of time (two appliances which have become indispensable are the Dash egg cooker and an Instant Pot). I cook extra portions of whatever is for dinner and pack her lunch and fill her water thermos the night before. I also write a love note which I include in my girl’s lunch. Simple: A heart, “I love you,” and a kitty sticker, just to let her know I am thinking about her. I thought she didn’t even notice or care until one day when we were running extra late, and I skipped the note. When she greeted me at the end of the day, the first thing she said was, “I am sad because you forgot to write me a note today.” Be sure to involve your children in the routines as much as possible, to include their ideas if they are old enough to share them, and to make accessible and organize things like clothes, shoes, and outerwear in a simp;e way so that children can find them and help themselves. Make sure everyone is getting to bed at a reasonable hour, including you. My girl is in bed and asleep by 7:30 pm. I, on the other hand, am often up much too late. I set a bedtime for myself of 10:00 pm and set an alarm a half hour before to remind myself to turn off the computer and begin to wind down and prepare for bed. I am finding it easier to wake up and stay calm and present throughout morning routines when I am in bed by 10:00 pm, and getting two to three hours more sleep than previously. I needed to commit to getting my rest as much as I was committing to helping her get hers. Create a simple and predictable morning routine and let your children participate. Get yourself dressed first, and then focus on your child(ren). We dress, feed the cat, sit down for breakfast, and then head upstairs to brush teeth together, before doing a quick once-over of our checklist to make sure we have everything we need before heading out. Start slow, begin earlier than you think you need to, and take a minute to center yourself. This exercise can be short and sweet. Just pause, take a deep breath, and mentally set an intention for the day before moving into action. I find inspiration at Daily Om. I was resistant to this idea until I tried it. I tend to jump right into task mode when I wake and have found that taking just five minutes to slow down and reflect consciously is a much more peaceful way to start the day. I don’t think I will ever be able to get up earlier than my girl, but some people swear this is possible and worth it. I tease that she and the cat are my alarm clocks and as long as I have them, I don’t need to set one. We have a morning ritual which I love, and which works for us. My girl comes downstairs and hops into bed with me for a cuddle before we get up to dress and eat. I sit down and eat breakfast with her, and we talk (as opposed to me rushing around trying to make lunch, find lost shoes, etc., while she sits at the table alone). I savor these moments of closeness and connection, and she seems to be more calm and cooperative when it comes time to get ready to go. Keep the TV, radio, computer, and phone off. Keeping the TV off was easy for me, since we don’t have one, but the phone was a bigger problem. Because I am self-employed and a lot of my work is online right now, it is so tempting to try to multi-task, read or respond to a few email messages or texts in between getting ready to leave. I decided that the phone would stay off until after I had dropped my girl at school. No email or work-related matter is so important that it can’t wait until 8;30 am. Keeping the phone off allows me to be fully present with my daughter in the morning and make the most of the short time we do have together before school. I would love to hear from you if you have found ideas that work to create better mornings in your home. It is such a common question, so today, I am going to offer some ideas originally shared in the Facebook group, RIE: Raising Babies Magda’s Way that may be helpful in thinking about how to approach this dilemma in a respectful way. Begin by understanding that living with young children means living with some (Okay, sometimes a lot of) mess. Learning, growing, playing, and creating is a messy affair. Letting go of the expectation that your home will be Pinterest perfect goes a long way. As with most things, encouraging cooperation and participation in cleaning puts the onus on us as parents to do most of the “heavy lifting” in the early years. It takes time, modeling and patience, and we have to try to see through the eyes of our children. It can be very helpful to create a yes space” within your home, which is essentially the child’s play space, and that way, toys are confined to one area. It can also be helpful to have baskets for easy sorting and cleaning up. But aside from these practicalities, it is important to build the habit and to invite, rather than insist upon or force cooperation, and this can begin at a very young age. During parent/infant education classes, I bring a large basket, and five to ten minutes before the end of class, I bring out the basket and very slowly begin to collect the toys, narrating what I am doing. This is a signal to the children that the class is drawing to a close, and we will soon be saying goodbye. I ask parents to remain seated and to stay relaxed as I gather toys. By the time children are young toddlers, when I bring the basket out, I usually have several eager and willing helpers. I usually pick up just a few toys, and then sit and let the children bring toys to me. I don’t expect or direct them to help, I don’t sing a clean up song, and I don’t make a big deal of it if some children choose not to participate. I would generally just start and let her join in any way she wanted to. At age two and a half, she eagerly participated in cleaning up. She had started to build these tall block towers, and I would always ask her if she’d like to leave them or if she’d like to knock them over and put them away and rebuild them later. Engaging her in the process and seeing clean up as a “wants something” caregiving time, and a cooperative effort was important. A good rule of thumb for both younger and older children is to not allow access to more toys than YOU are willing or able to pick up all by yourself. This does not have to be a battle. Children don’t need to be threatened with consequences, manipulated or bribed in order to participate in this process. So, what do you think? Are you ready for a shift in how you approach clean up with your children? I am so excited and honored to be teaming up with Janet Lansbury to offer an afternoon question and answer symposium in Santa Cruz, CA , on October 7, 2017. I hope some of you will be able to join us. It is sure to be a lively discussion! Tickets are available now, and you can purchase by clicking on the link below. Each paid ticket will also be entered into a drawing to win prizes such as signed copies of Janet’s bestselling books, Elevating Childcare and No Bad Kids, a personal phone consult with Janet or me, a free parent/infant class, and a infant toy basket. For those of you who can’t attend, Janet offers wonderful resources online to support you in your parenting journey, including her Respectful Parenting podcast series, and new recorded sessions, which are are individual recordings of live consultations with parents discussing their most pressing parenting issues. My girl is adopted. She is my biological niece, and my daughter. We are four and a half years into our relationship together. I unexpectedly became her mother at the age of forty nine years old, (after twenty five years of being a professional infant toddler caregiver and educator), under the most unusual and trying of circumstances. We have had quite the journey together. Late last year, she was diagnosed as autistic. This is a short meditation on what becoming and being her mother has meant to me, what I have struggled with, and what I am learning from her. I am sharing it with hope that it might speak to and inspire you, no matter what your story or your circumstances. I am my child’s mother. She chose me. I chose her. I am a good mother to and for my child. I am not a perfect person or a perfect mother, but I am the perfect mother to and for my child. I love my child. More importantly, I am committed to parenting her respectfully. I show up and do my best every day. I try to see her and understand her for who she is, apart from me. I try to honor her and her unique person-hood and journey and to give her what she needs to survive and thrive. I observe and listen to her closely, and let my intuition guide me to meet her true needs in the way that serves her best. I remain open. In meeting her needs, I also try to honor myself, to be real and authentic in relationship to her. I recognize that I have needs, limits, and boundaries, and it is OK and important to assert them. I can’t always meet all of her needs or demands in a perfect or total way, as she would wish, and sometimes, she may be upset with me for setting limits, and that is OK. I need only to acknowledge her feelings, and to continue to be open, to listen, to observe. I continue to seek, to question, to do my best for her and for myself. I won’t quit. I won’t leave. I won’t give up on either of us. I won’t stop loving her, listening to her, or trying to understand her. I will make mistakes. I will fall. I will fail. I will misunderstand. But I will learn from my mistakes. I will admit them. I will apologize. I will seek, ask for, and accept help for both of us, if need be. I will move on. And so will she. I choose to believe that my love, my commitment, my trying is enough. Good enough. Enough to make a difference for her and for me. Enough to bond us together. Enough to nurture her and launch her into the world in a happy (enough), healthy (enough) way so that she can survive and thrive. Her journey, her experience of life, of people, will be different than mine, and that, I believe, is a good thing. Although she has experienced much struggle in her short life, I hope that our relationship will be a bedrock for her, even when I am no longer present on this earth. I hope she will learn and feel that although I am not perfect, although I often feel inadequate, broken, lost, and alone, although I often make mistakes, I show up for her. I seek to see her for who she is, to celebrate her unique strengths. I believe in her. I am there as a guide, and on her side, not hovering, but available. I am her greatest advocate and cheerleader. She is my greatest teacher. I aim to make better and different choices for both of us, than were made for me when I was growing up. I strive to understand myself and my past in order not to revisit upon her what was done to me. Again, I am not perfect. I fall. I fail. I make mistakes. But always, I get up and try again. I lead with love. I lead with a desire to know, understand, and celebrate her for exactly who she is. I lead with an open heart and an open mind. I continue to learn and grow so that she can learn and grow. We are a work in progress, both of us, and our relationship. It is perfect as it is, even when it doesn’t look pretty from the outside, or the sailing isn’t smooth. I love. I love. I love. I show up. I try. I try. I try. I trust. I let go. She lights the way for both of us. And that is enough. That is all. May she grow up to know this. May she feel it. May it be enough. It is enough. It is all. With love and thanks to the many therapists, teachers, friends, and families, too numerous to mention, who have prepared me, guided me, inspired me, and supported me in this journey, but most especially, to Magda Gerber, and Janet Lansbury. “Can you explain why we don’t need to tell toddlers to say sorry, thank you, please, etc? My child’s caregiver told her she needs to say sorry when she “does something bad”, which in this case was poking the caregiver’s eye. My daughter is 19 months old. “Say please.” “Say thank you.” “Say you’re sorry.” “Say hello.” “Say goodbye.” We can instruct or insist that our young children parrot our words, but if we want them to develop true kindness, if we want them to develop social graces and true empathy, if we want them to develop the ability to feel and express true gratitude, if we want them to express true sorrow when they have hurt someone (even inadvertently), directly instructing them isn’t the way to go. Instead, I suggest trusting children and modeling for them the values and attitudes we desire to instill. If young children are treated and talked to with respect, they will, in time, learn to talk to and treat others with kindness and respect, no prompting or reminders needed, and it’s a beautiful thing to witness a young child acting from a genuine and authentic place, as opposed to hearing them issue a half hearted and hasty thank you or I’m sorry that is prompted by an adult. “Do you ever make your child on the ‪#‎autism‬ spectrum say “hello,” shake someone’s hand, pose for photos, or obey some similar‪#‎SocialConvention‬? I completely understand where the desire to do this comes from. And, because of this, I’m also aware that it might be hard to see how counterproductive it can be. 1) It breaks trust and connection by forcing the child to do something against his/her will. 2) It creates a control battle, which actually causes our kids to dig in and resist more. Until my child was about three and a half years old, she never once uttered a please, a thank you, or an I’m sorry, and hellos and goodbyes were pretty hit or miss as well. She’s a gentle, observant child who feels deeply and is quite verbal, but is a little slow to warm in social situations. I trusted that if I was patient and continued to model for her, that one day, she would spontaneously begin to express her feelings in socially acceptable ways, and sure enough, she did. She now routinely greets friends with hugs and blows kisses goodbye, she shows concern and offers comfort when a friend is sad or has been injured, she says please and thank you regularly, and at the park the other day, she spontaneously offered to share her snack with a little girl who was eyeing her kale chips. It began one day when our cat Pandera was ill, and Carmel, the woman who had fostered her, came to check on her and administer medicine. She also brought a book for R. which she thought R. would enjoy, (since my little one is obsessed with all things cat). R. was quite worried about Pandera, and I told her that Carmel was going to come and check on her while she was at school that day. On the way home from school, R. asked about Pandera, and I told her Carmel had visited, and Pandera seemed to be feeling much better. I also mentioned that Carmel had left a book for R. to read to Pandera.R. was relieved and excited, “I’m so glad Pandera is feeling better, Mama.” Then…. “Mama, I want to write a card to say thank you to Carmel for helping Pandera, and for bringing me a book. Pandera is a special cat, and Carmel is special because she took care of Pandera, AND she brought me a book to read to Pandera. Is that a good idea?” I said that I thought it was a fine idea. My heart swelled. That, my friends, was a three and a half year old child’s genuine, heartfelt, and authentic expression of gratitude to another human being she felt a connection with, and it was so worth waiting for her to come to the point of wanting and being able to express it in her own way. Trust. Model. Believe in the inherent goodness and intelligence of your child. Please, thank you, hello, goodbye, and I’m sorry will come in it’s own good time. My child is three years old now, but has been having some health challenges which make it necessary to carefully track food intake, medication, diaper contents, sleep, mood, and activity, in order to share with health care professionals. Enter Baby Connect. Rarely (Okay, never!) have I been as excited about an app as I am about this one, which is why I’m sharing. I would have loved to have known about this tool or have had it available to me when I was working as a nanny or an infant/toddler teacher, as I regularly kept written logs of each child’s day and critical information such as diaper changes, amount of milk and food consumed, sleep and wake times, etc., for parents. I often ask parents to keep simple logs for me when I’m doing consults, particularly when their concerns are around sleep. All of these little details of a baby’s day and routine are important in the early years, and give clues about a child’s overall health and growth. Often, it’s not so easy to accurately keep track of these details. Baby Connect makes it a cinch to keep track of crucial information. I have been using it for about a week now, and I have to tell you, it beats pen and paper hands down. It is an easy to use, comprehensive tool. The app tracks and graphs changes over time, which is also helpful. It can be customized, easily shared with others, and used on multiple devices. It can record feedings, nursing, naps, diapers, milestones, pumping, baby’s mood, temperature, activities, and even gps location. If you have more than one child, or care for more than one child, the app can manage that. A web interface is also accessible for free, so a childcare provider doesn’t need a smart phone to view and enter information about the child, and I like that I can easily share information with my child’s health care provider via the web interface. I also appreciate the diary feature, and that I can even take pictures from the app. With one click, I can accurately record the time and most important pieces of information as an event occurs, and then I can go back to record or fill in additional details later, so as not to take time away from being present for my child. Take a look at the video below for a demonstration. Honestly, it’s the best $4.99 I have ever spent. I just wish I had known about it sooner. Note: The link provided is an Affiliate Link from Amazon, which means if you choose to purchase through this link, I receive a small percentage of the sale, which helps to me to defray the cost of maintaining this blog. “I see you as the separate little person that you are. You know and feel things that you want and need to express. You want and need to be heard. You have a lot to say. I see you. I hear you. I’m listening. I want to hear and understand who you are and what you have to say. Tell me. I am here for you.” This is a conversation and relationship that begins at birth and evolves over time. You convey this message to your young baby through your words, through your touch, through maintaining an attitude of curiosity, openness, and respect. “Remember, crying is a baby’s language—it is a way to express pain, anger, and sadness. Acknowledge the emotions your baby is expressing. Let him know he has communicated. I remember the first time I held my girl as if it was yesterday, even though that was two and a half years ago. She was just a few weeks old. As soon as she was placed in my arms, she began vocalizing. This was something that everyone present would notice and comment on over a period of four months, during the precious one hour visits we were allowed weekly. “As soon as she is in your arms, she starts “talking”. Enter into the conversation with your baby. Let her know that what she has to say is important to you, and that you are trying to understand. Ask her questions and wait for her response. Be with her in her experience as fully as you are able. It’s the beginning of a beautiful relationship, and a lifetime of conversation. Tabitha writes, “I wanted to share an experience from my family’s first vacation. I just returned form a two-week stay in Mexico with my husband and 15 month old daughter. The first week was shared with my entire extended family as we celebrated the wedding of my younger sister. I was extremely excited to introduce my daughter to the beach and the swimming pool. I grew up in the water and my daughter loves the bath so I looked forward to her excitement in playing in such vast bodies of water. We have been taking RIE classes since my little one was 7 months old, but it was as if everything got thrown out the window at the beginning of vacation. After arrival, we immediately went down to the pool to meet my family so everyone could see my daughter’s first pool experience. In my excitement, I did not see that it had become about everyone else’s experience, not my daughter’s. My husband and I got in, but my daughter was hesitant. I still can’t believe it, but I picked her up and brought her in with me! She started crying and I looked around at my family members (strangers to her at this point) trying to “make” her happy by making crazy faces at her and I was snapped back to reality. What was I doing? We got out, I apologized to her for bringing her in when she was clearly not ready, and we explored the grounds by her lead. Later that day, I walked with her down to the beach, just me and my daughter. I explained where we were going but I had no expectations, no agenda. We walked to where the sand meets the water and I sat down and my daughter stood between my legs. Our faces were next to each other as we looked out to the ocean. She stood there for five minutes, mouth half open in awe. Five quiet minutes of awe. 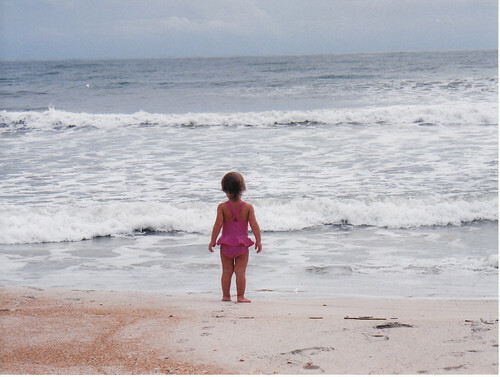 She will never see the ocean again for the first time, and I was fully present, and honored to share the moment. It was so beautifully overwhelming, I shed tears. After five minutes, she pushed off me and walked right into the water! On her terms. It was hard keeping her out of the water for the rest of vacation (even the pool, after allowing her to enter on her terms). Reflecting that night, I realized the pool experience was really all about me, masked as me giving her an experience. I wanted to force a beautiful moment like what happened on the beach, yet, what happened on the beach unfolded organically. I didn’t know we were going to have that moment, I was just present to receive the gift. Funny, cameras documented everything at the pool and we have none of the beach moment yet that five-minute memory is seared into my soul. I love RIE, love this community, and love the continued inspiration to grow as a mother. I appreciate Tabitha allowing me to share this beautiful story, which I feels illustrates the profound connection and joy available to both parents and young children when we can slow down just a little to be present with, and allow for what naturally unfolds, leaving our agenda behind, and trusting our children to be active participants in their own experience, recognizing that they have a point of view too. If you’d like to learn more, the community Tabitha is referring to can be found here, and the basic premises of RIE can be found here. Often, in instances like this, parents are tempted to give in or give up, or they wear themselves out trying to reason with their toddler, and they may become frustrated when they give choice after choice, but their toddler rejects every option. Sometimes, parents resort to yelling or spanking, or sometimes, they end up bringing a diaper clad but otherwise naked toddler to childcare, and asking for help! The answer to this question is to pause to allow for and acknowledge your toddler’s feelings, and then, to calmly carry on. But what does this look and sound like in practice? Parent and teacher, Sarah Morrison, sheds some light based on a realization she had after attending a conference held in Sacramento, in October of last year, where she listened to a keynote speech given by RIE Associate Janet Lansbury. Somehow, when you include the “but” and everything that follows, it seems to invalidate the preceding part of the statement. As an example, if I was overwhelmed and stressed to the limit with my responsibilities and poured my heart out to my husband and he replied, “You are so, so unhappy right now. You feel like there’s just too much on your plate, BUT you’re the one who is home during the day and these things still need to get done.”, I would NOT feel very understood. ANYWAY, that’s not what my epiphany was. As I was meditating on Janet’s presentation, I suddenly realized that RIE (Resources For Infant Educarers, the organization and approach founded by Magda Gerber) is not about treating children like mini-adults (a common misinterpretation of Magda Gerber’s philosophy), it’s about treating them with the understanding that they are PEOPLE. A child’s brain does not have the same developed powers of logic and reasoning that a fully formed adult brain has, therefore, it’s unreasonable to present them with our wonderfully reasoned, logical, and intricate arguments for and against every limit that must be set. It’s not appropriate for us to give toddlers complete autonomy in choices of nutrition, proper clothing, or safety and health issues. It is our responsibility to make these decisions and hold these limits without wavering in the face of their displeasure, but to do it with love and empathy for their feelings. This is pretty much the way I’ve operated since first introducing RIE ideas into my program and family, but I was having trouble explaining to others the nuances of the principles I was trying to work with. I think the distinction between treating a child as an Adult versus as a Person may make it easier to understand. What I took from Janet’s presentation was that honestly acknowledging and being respectful of a child’s feelings or point of view shouldn’t have any qualifiers. It’s enough (and more respectful) to simply observe, “You really don’t want to get in the car. You want to stay and play.” And then, just be in that moment with them. Adding, “BUT we’re running late and you need to get buckled in right now”, kind of just runs roughshod over what they’re feeling and perhaps invalidates it. I think this a a perfect time for Magda Gerber’s advice to Slow Down. I’d love to hear your questions, comments, and thoughts about setting limits with empathy. For more reading on a gentle, effective approach to discipline with infants and toddlers, I highly recommend following this link and checking out the many articles Janet Lansbury has written on the topic. A special thanks to Sarah Morrison, who is an Early Childhood specialist who lives in Northern California. Her passion for providing quality child care for young children led her to study Waldorf Education with Lifeways North America, which is where she was introduced to the inspired writings of Magda Gerber and RIE. Soon after, she completed the RIE Foundations course. Sarah runs a mixed-age nursery school program from her home. The above video is courtesy of Kids In The House, which is a (still) new web site that was launched in April 2013, and is a tremendously valuable FREE resource for parents. The site’s creator, Leana Greene, and her team worked tirelessly for over three years to create over 8,000, 1-minute videos (with transcripts), from just about every expert under the sun, discussing just about every parenting topic you can imagine. I was honored to be asked to participate and was interviewed alongside one of my greatest teachers and mentors, (and also one of my favorite people in the world), Janet Lansbury, who is author of the blog, elevating childcare, and a specialist in Magda Gerber’s RIE parenting philosophy. This site is really a treasure, and I encourage you to check it out and explore all it has to offer. For those of you who are interested in reading more about some of the other questions I address in the interview, you can find the articles by clicking on the links below. What to say instead of “NO”!